Most sources say VHS magnetic tape has a life-span of about 30 years. For many tapes in our collection their 30th birthday has come and gone. The degradation is evident. The sound goes tinny, the image begins to streak and rattle across the screen. Have no fear, we are currently in the process of migrating our VHS to DVD and digital format. Until now, I had hardly browsed our VHS collection, but this project has given us a chance to view some real gems. VHS was the main form of commercial video for about 20 years in the ’80s and ’90s, so this collection falls heavily within those decades. We have VHS tapes of A&E Biographies of famous Hoosiers. Many contain original local programming. 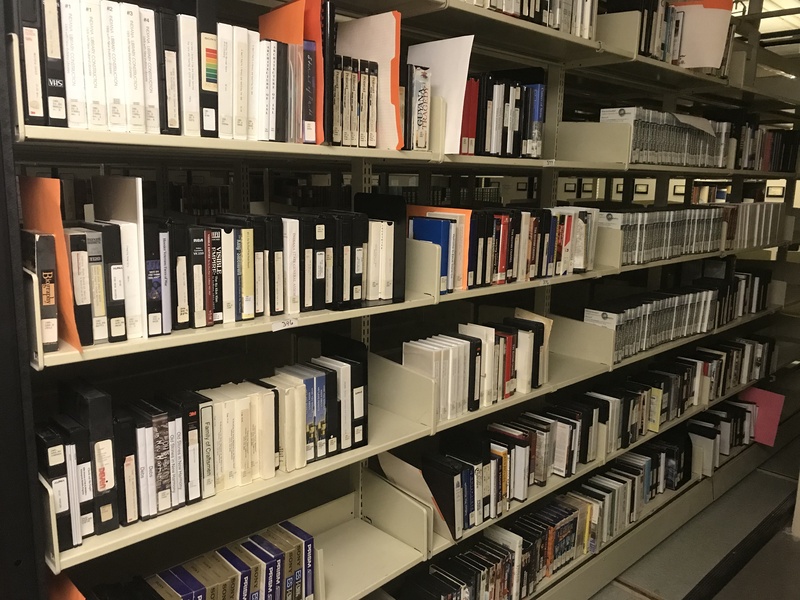 Do any of these programs jog your memory: “Hoosier History” with Rick Maultra on TV-16, “Across Indiana” on WFYI or “Our Hoosier Heritage” on WFBM? Some of the VHS is footage originally transferred from 16mm film. It was converted to VHS to preserve the film and make it accessible. From the VHS we will make DVDs. We have a couple of these on the State Library’s YouTube channel. Bernie Sanders’ film about the Socialist-party leader from Indiana, “Eugene V. Debs.” The film was made in 1979. Sanders doesn’t appear on screen, but you’ll recognize his voice as Debs. “Family of Craftsmen” is a promotional company film from 1953. The film follows the Bokon family of South Bend who work at the Studebaker plant. “Family of Craftsmen” is available on Archive.org. Moving images capture our attention and allow us to see the past more vividly. We’ve transferred footage of the Foster P. Johnson family hamming it up for the home camera in the 1930s. Do you have any interesting videos in your home collections? It’s time to get in touch with a professional and have them transferred! This post was written by Indiana Collection Supervisor Monique Howell. This entry was posted in Indiana Division and tagged Collections, digital, DVD, technology, transfer, VHS by indianastatelibrary. Bookmark the permalink.